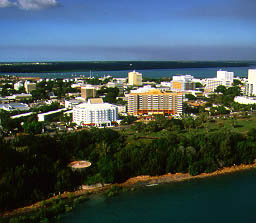 Darwin, the capital of the Northern Territory, at the Top End of Australia is a remote modern city of 78 000 people. It has a tropical monsoonal climate. The Wet season is October to March. The dry season is a more comfortable time to visit. Darwin was bombed 64 times in World War II and again razed to the ground by the devastating cyclone Tracy on Christmas Eve 1974. Around this time of year there are always big thunderstorms. Modern Darwin is today a fast growing centre and a major stop for tourists. Do not swim in and around Darwin due to highly deadly and almost invisible box jellyfish in the sea, and large salt water crocodiles in the sea and rivers. Darwin Region Tourism Association Centre Cnr Knuckey and Mitchell Sts. Phone 08 8981 4300. Open Monday to Friday 8.30am to 6pm, Saturday 9am to 3pm, Sunday 10am to 2pm. Smith St Mall is where most shops are. This old wharf precinct has been done up for tourists. There are a number of restaurants and a nearby food court. Weekends during the Dry season are craft markets. Australian Pearling Exhibition has excellent displays and videos of the region's pearl diving history. Phone 08 8941 2177. Open weekdays 10am to 5pm, weekends 10am to 6pm. Entry $6, children $3. Indo-Pacific Marine is an aquarium. There are a number of small tanks showing various ocean ecosystems. The huge coral reef tank with reef fish is excellent. Phone 08 8981 1294. Open daily 10am to 5pm, 9am to 1pm during the Wet season. Entry $12, children $4. Oil Storage Tunnels were dug into the cliff during World War II to protect fuel supplies from Japanese bombing raids. Open daily 9am to 5pm. Admission into the dimly lit tunnels is $4. Inside are photographs of the war period. The entrance is below Survivor's Lookout which has a map explaining the tragic events of the first day of bombing. Government House is Darwin's oldest building and home of the Northern Territory administrator since 1870. Opposite a monument shows where the marine telegraph cable from Java came ashore and the great Overland Telegraph Line to Adelaide began. This was for a long period Australia's only link to the outside world. The new Parliament Building (Mitchell St near the Esplanade) is massive given the small size of Darwin. It also houses the Northern Territory Library. Aquascene Thousands of fish come ashore here to be fed stale bread at high tide - check tide times. It is popular with children. Doctor's Gully, the Esplanade. Phone 08 8981 7837. Admission $4. Botanic Gardens Most of the trees were uprooted by cyclone Tracy, but everything regrows fast in the hot tropical climate. 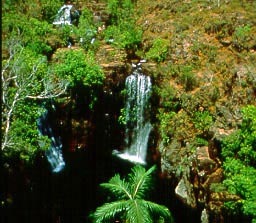 There are fig trees, palms, a wetland, rainforest, waterfall and fern and orchid greenhouse. Gardens Rd. Phone 08 8999 5535. Museum and Art Gallery of the Northern Territory Houses an excellent collection of Aboriginal bark paintings and good Indonesian and Pacific island art. Other displays include a big stuffed crocodile, dead box jelly fish in a jar and maritime display with pearling boat and Vietnamese refugee boat. Conacher St, Bullocky Point, Fannie Bay. Phone 08 8999 4211. Open weekdays 9am to 5pm, weekends 10am to 5pm. Admission free. Bus 4 and 6 pass close by. Fannie Bay Gaol This disused jail is open to the public. You can see the cells and gallows. There is also a small museum. Cnr East Point Rd and Ross Smith Ave, Fannie Bay. Open daily 10am to 5pm. Admission free. Phone 08 8999 8290. Bus 4 and 6 pass close by. East Point Reserve has pleasant beaches and lawns, forest and cliffs. You can watch the sunset across the bay from here. Wildlife is more prolific at dusk. Military Museum East Point Rd. Phone 08 8981 9702. Open daily 9.30am to 5pm. Admission $5. 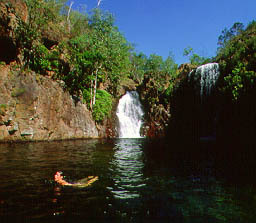 Howard Springs Nature Reserve A crocodile-free swimming hols 35km east of Darwin set in forest. It is popular and can get crowded. Graeme Gow's Reptile World at Humpty Doo has a large collection of Australian snakes. Open daily 8.30am to 5.30pm. $5. Fogg Dam Conservation Reserve is good for bird watching, especially at dawn and dusk. It is 15km beyond Humpty Doo. Window on the Wetlands has a visitor centre on a hill with good views of the wetland and excellent displays on the wetland ecosystems. Adelaide River Crossing From here there are 90 minutes river cruises where they feed the crocs over the side of the boat by making them jump out the water. Pretty silly really, but fun. $26, children $15. 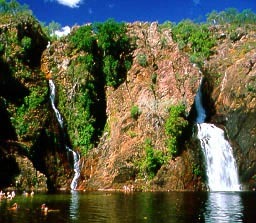 Mary River Crossing is popular for barramundi fishing and camping. The wetlands here are similar to Kakadu but much less touristy. At Annaburro 2km further is accommodation. Single $22, double $35. Phone 08 8978 8988. Crocodylus Wildlife Cruises, 40km north of Arnhem Hwy, has excellent fresh and salt water wetlands cruises at 6.30am, 10.30am and 3.30pm for $45. Phone 08 8927 0777. Darwin Crocodile Farm The best time to visit is during feeding time at 2pm. Stuart Hwy, 40km south of Darwin. Phone 08 8988 1450. Open daily 10am to 4pm, tours every hour on the hour. $10, children $5. Territory Wildlife Park At Berry Springs. This superb wildlife park with a bushland setting has bird aviaries, mammals, reptile house, fish and nocturnal animal house. Phone 08 8988 6000. Admission $12, children $6. Open daily 8am to 6pm. No entry after 4pm. Well worth visiting. See the tourist information centre for more detail. 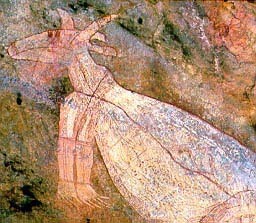 There are expensive Aboriginal cultural tours that involve flights on charter planes to outlying areas. Darwin Day Tours has a 5 hour city sights tour that finishes with sunset at East point reserve. Phone 08 8981 8696. Cost $34, children $18. Keetleys Tours has a similar 3 hour tour. Phone 1800 807 868. Tour Tub is a hop-on hop-off bus which does circuits of the various sights. $15, children $7.50. Phone unknown. There are also harbour cruises and Barramundi fishing farm tours and tours further away. Darwin City YHA Hostel is newly renovated. 69A Mitchell St, part of the bus transit centre. All rooms are twin. Air-con at night. $17 per person. Doubles with own bathroom $48. Pool, kitchen, open-air dining area, sundeck, travel service. Globetrotters 97 Mitchell St. Bed in 4 bed dorm with own bathroom, air-con, fridge and TV for $14. Breakfast and dinner included. Bar, cheap meals, free bike hire. Double room with own bathroom is $44. Pool, 2 kitchens and frequent barbecues. Melaleuca Lodge Opposite the bus transit centre. Phone 1800 623 543. Dorm $15, double with fridge and TV $44. Air-con at night. Pool, kitchen, travel service. Elke's inner City Backpackers has a garden setting in renovated houses. 112 Mitchell St just north of town. Phone 1800 808 365. Dorm $15, twin $38. Pool, spa. YWCA Banyan View Lodge is big and accepts women and men. 119 Mitchell St, just north of town. Phone 08 8981 8644. Single $28 ($30 with air-con), double $40 ($45 with air-con). Rooms have fridge and fan. Kitchen, 2 TV lounges, spa. Frogshoolow Backpackers is modern. 27 Lindsay St. Phone 1800 068 686. Dorm $14, double $33 ($38 with air-con, $44 with private bathroom, air-con and TV). Kitchen, lounge, travel information and pickups from the bus transit centre and airport. Nomads Darwin Next door to the bus transit centre. Phone 08 8941 9722. Bed in 4 bed dorm $15, bed in twin room $18. 2 spas, sundeck. Fawlty Towers in an old elevated house has a friendly atmosphere. 88 Mitchell St. Phone 1800 068 886. Dorm $14, double $38. Darwin City Lodge is an old house with friendly owners. 151 Mitchell St, just north of town. Phone 1800 808 151. Dorm $14, twin $38. Most rooms have air-con. Gecko Lodge is in an old house. 146 Mitchell St, just north of town. Phone 1800 811 250. Dorm $14, twin $40. Air-con at night. Pool, lounge. 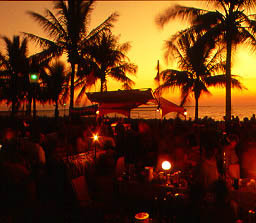 The bustling Asian hawker stall market on Thursday night during the dry season at Mindil Beach (pictured) is popular with locals who start arriving with their tables, chairs and beer from 5.30pm. There are many food stalls and the prices are cheap. During the wet the market moves to Rapid Creek. Bus 4 and 6 go past Mindil Beach, 2km north of town. Bus 4 continues to Rapid Creek. Other nights there is a similar market on the Smith St Mall. There is a cheap food centre at the bus transit centre and numerous lunch time cafes on Smith St Mall. There are also food court in the shopping centres on the mall. Pulse is a twice monthly entertainment magazine available from youth hostels. Rattle and Hum bar on the Esplanade is popular with backpackers , probably because of the courtesy bus to all the hostels. Time nightclub is on a small street between Smith and Cavenagh Sts near Knuckey St and is very popular. The Brewery Bar at The Top End Hotel on the corner of Mitchell and Daly Sts is popular as is the Beachcomber Bar out the back with disco Saturday and Wednesday. Victoria Hotel has live bands upstairs Wednesday to Saturday from 9pm. Shennanigans Irish pub is next to the bus transit centre. Billabong Bar in the Novotel on the corner of the Esplanade and Peel St has live bands Friday and Saturday night. The Jabiru Bar there has crab races Wednesday night. Don Hotel on Cavenagh St has live music and disco. There are several cinemas in town. Deckchair Cinema is outdoor by Stokes Hill Wharf. It runs in the evening during the Dry season. 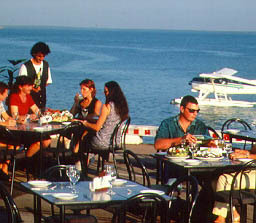 MGM Grand Darwin is at Mindil Beach 2km north of town. Men wear long pants. Avis 145 Sturt Hwy, Stuart Park. Phone 1800 225 533. Brits: Australia which has campervans. Stuart Hwy, Stuart Park. Phone 1800 331 454. Budget 69 Mitchell St. Phone 132727. Hertz Cnr Smith and Daly Sts. Phone 1800 891 112. Thrify Smith St. Phone 1800 652 008. Territory Rent-a-Car 64 Stuart Hwy, Parap. Phone 1800 891 125. Rent-a-Rocket which has mostly 1970s cars from $30 a day. 7 McLachlan St. Phone 08 8941 3733. Nifty Rent-a-Car has older cars, some with air-con from $44 a day. Mitchell St. Phone 08 8981 2999. Darwin has a weekday and Saturday morning metropolitan bus service. They enter the city on Mitchell St and leave on Cavanagh St. The small terminal is on harry Chan Ave near Smith St. Phone 08 8989 6540. Fares are $1-$2. Darwin airport has domestic flights to Australian large cities and Alice Springs. International flights go to Bali, Kuala Lumpur, Singapore, Brunei, Hong Kong and Manilla. Qantas office is at 16 Bennet St. Phone 131313. Ansett office is at 14 Smith St Mall. Phone 131300. Singapore Airlines is at Paspalis Centrepoint, Cnr Smith St Mall and Knuckey St. Phone 08 8941 1799. Garuda Indonesia office is on Cavenagh St. Phone 1800 800 873. Malaysia Airlines does not have an office. Contact a travel agent. Royal Brunei Airlines is on Cavenagh St. Phone 08 8941 0966. The airport is 6km from town. Taxi fare is around $15. The airport to city shuttle is $8. Phone 08 8941 5000. They drop-off and pick-up almost anywhere in town. Greyhound Pioneer (phone 132030) operates from the bus transit centre, 69 Mitchell St.
McCafferty's runs from their bus station near the corner of Peel and Smith Sts. Phone 131499. Buses go to Adelaide, Queensland and Western Australia. Alice Springs is 19 hours $150. Kakadu National Park World heritage listed wetlands. Via Katherine and then through Australia's dry red centre down the Stuart Highway through Alice Springs, detouring to the famous Ayres Rock, and through Coober Pedy frontier opal mining town and Port Augusta which has numerous road and rail connections in other directions. First go south through Katherine to Threeways near Tennant Creek then east through Mt Isa to Townsville on the Great Barrier Reef. First travel south to Katherine then turn west to Kununurra, Wyndham, derby, Broome and Port Hedland.